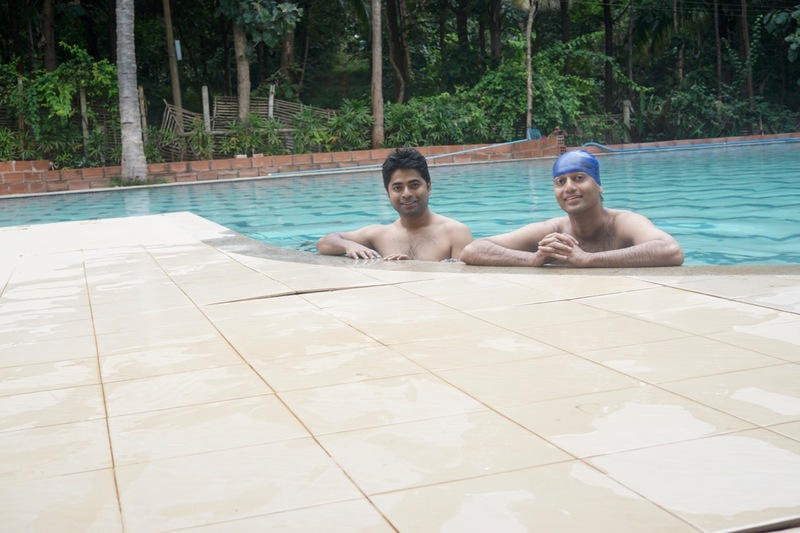 Every year, around this time, our department plans an outing to some place in the outskirts of Bangalore. This year, people voted for a resort called Urban Valley (check here). Google Maps labels this place as Bluemoon Retreat. I can only guess that they had undergone a rebranding exercise. You might be interested to read the 2 or 3 star reviews. Our collective experience was pretty close to that. For the sake of privacy, I will not put up the photographs from the activities and general socialising. Instead, I will just walk you through my experiences. The interior roads are nicely paved. 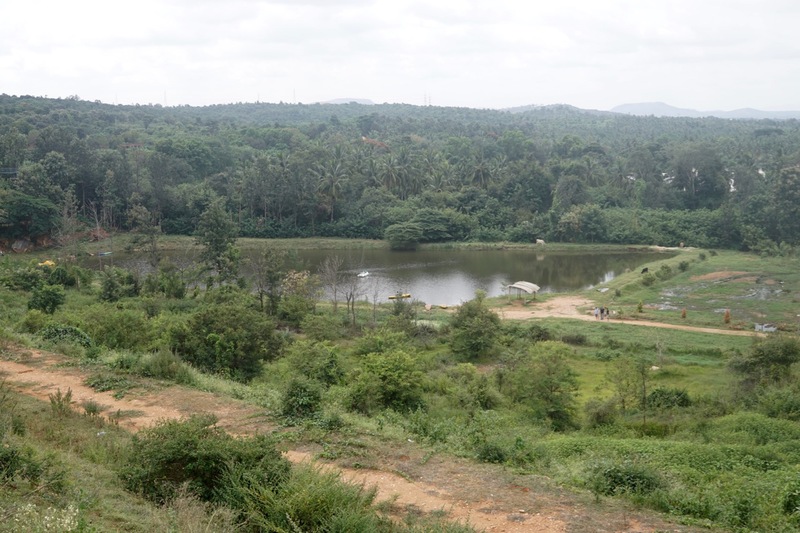 The area on the left is another resort that overlooks the Chudanahalli lake. There were a lot of dogs in the premises. There was at least one Husky and one Saint Bernard. 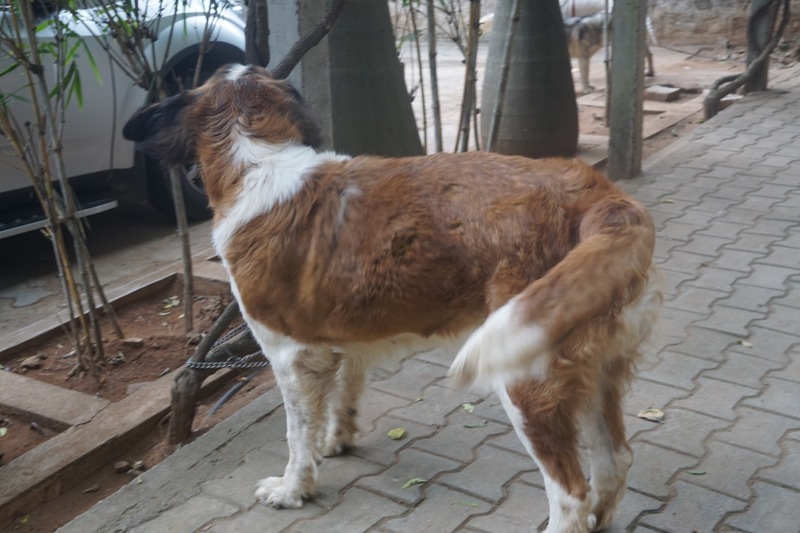 Since both breeds are native to colder (Arctic) climates, I do not know how they were coping up with the weather of Bangalore. As such both of them were pretty docile and sleepy. 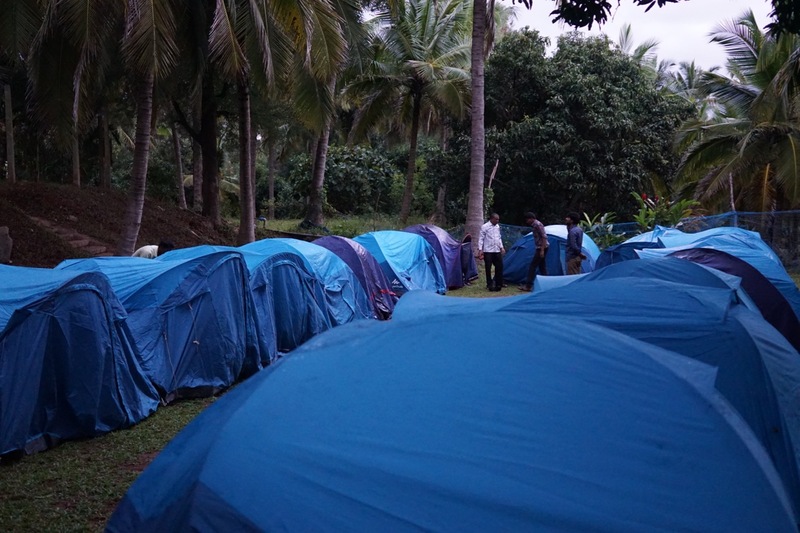 While the group was shaking a leg, the guys at the resort were busy setting up the tents for our overnight sleep. All the ladies skipped the outdoor bed and crashed inside a large room. Quite a few guys chose the comfort of an AC, even if it meant that there were quite a few people crammed up in an 11×11 room. Lots of Quechua Arpenaz 2s. We had good fun with the bonfire and the introduction sessions (read: orientation for the new employees). Some guys had opened up a few cans of beer and enjoyed themselves. It was during this time that something bad happened. People realised that most of the booze had gone missing. These were stocked in a cooler kept inside the kitchen. It turned out that they were stolen by the workers! The owner confronted them and recovered some bottles. However, most of it was gone. She promised that we would get back our stocks by next morning. Truth be told, the liquour was not replenished before 12:30 pm the next day. I do not know if that was any consolation to the people who needed the booze during the previous night. This prompted me to carry my bag everywhere with me and not leave it unattended. This is Rueben with his blue swimming cap. Hold on, the story of stealing doesn’t end there. After Rueben had finished his swim, he took his swimming cap off, kept it on a table nearby and went to have a shower. When he returned, he saw the life guard / supervisor sitting near the table. His cap was missing. The guy categorically denied seeing any cap. After some altercation, he got up and gave Rueben his cap on which he was sitting! He defended himself by saying that he thought Rueben referred to caps that people normally wear. Who would swim with hip-hop caps? And why was he sitting on it unless he had the intention of hiding it from its rightful owner? That morning I went around exploring the area with some of my colleagues. 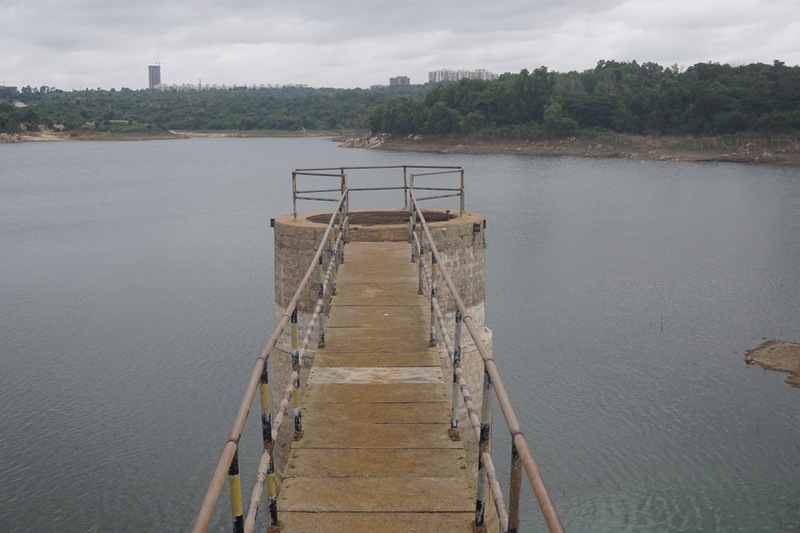 The most striking place is the Chudanahalli Lake. It is not easy to get there from the resort. One will have to jump the fence and walk through some shrubs in order to get there. There are two such piers jutting out into the lake from the raised walkway on the embankment. 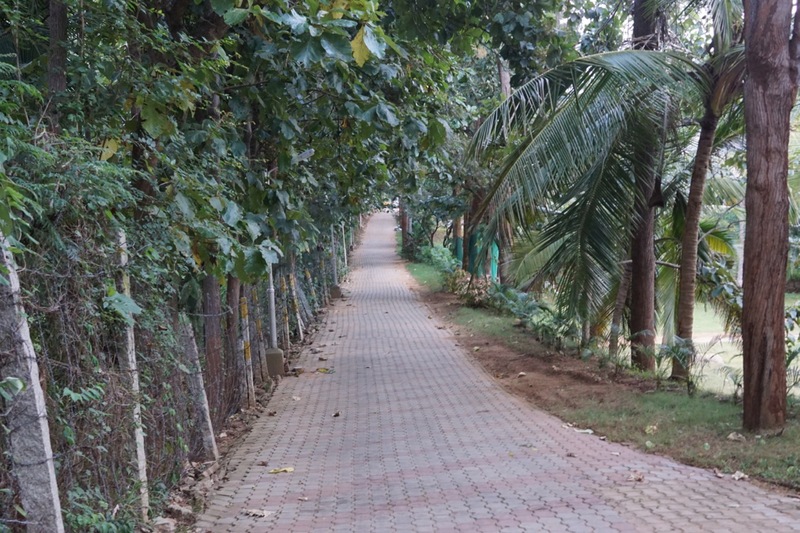 An artificial lake within the resort premises was used for jet skiing and kayaking. 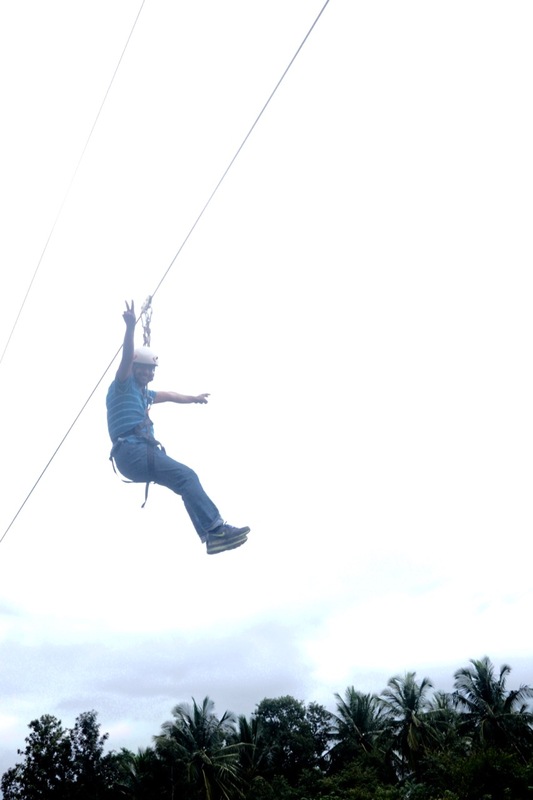 There is a zipline that runs over the lake. 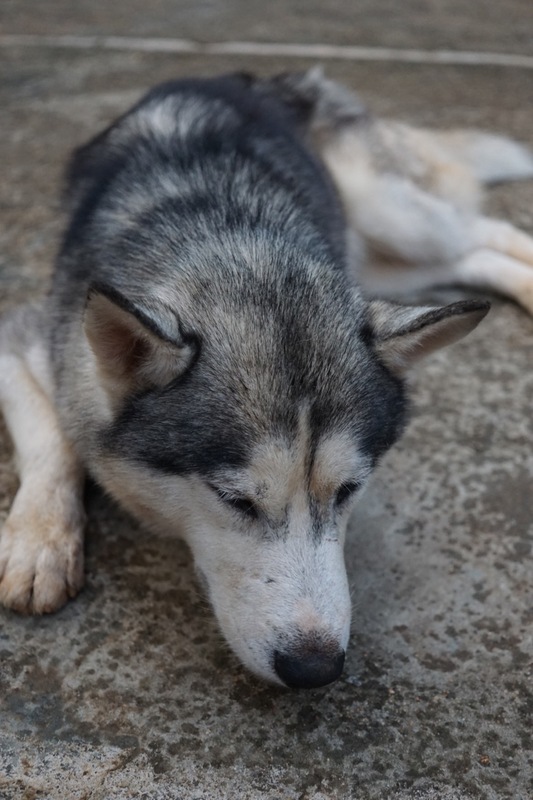 This is Mainak posing for the camera. There were few other activities, like ATV riding, paintball, etc. I did not do most of the things. Moving from a point and shoot to an advanced camera system is not easy. There is a learning curve. About 40% of the photos I took during this trip were rubbish. Still, it is a better ratio than my last outing. The stock zoom lens (16-50) is a better option for most of the daylight stuff. The 30 mm prime is better for night stuff – that too only when people aren’t moving. Battery drains out much faster than the cards getting filled with images. The solution to this is quite expensive. Sometimes it is better to take photos using the smartphone camera. Every camera has its limits.